I’m back! 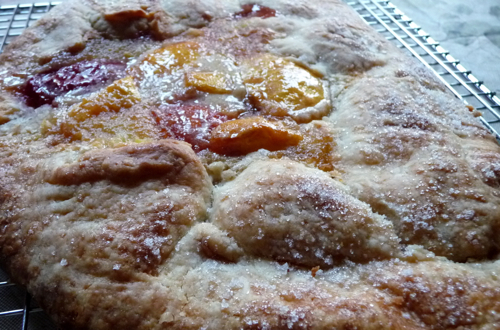 This week’s recipe is Summer Fruit Galette, chosen by Michelle of Michelle in Colorado Springs (she has the recipe if you want to try it for yourself). Once again I have to admit that #1 Son did the honors, cutting the recipe in half and making a lovely half-circle of summery, fruity goodness. He used half peaches, half nectarines. Now, I’m already on record as not liking fruit-based desserts. I didn’t even try that blueberry pie a few weeks ago, the one that everyone, both in my family and here at TWD, raved about. But I had some of the galette. Oh, yes, I did. And it was marvelous. I won’t go so far as to say it made me like fruit, but I’m certainly more inclined to give it a chance in the future. Go check out what the other TWD bakers did with this one — it’s sure to be a treat. This entry was posted Tuesday, July 29th, 2008 at 8:00 am	and is filed under Uncategorized. You can leave a response, or trackback from your own site. I’m glad you’ve changed your mind about fruit desserts. they can be reallie quite good sometimes yes? Good job! I’m glad you liked this fruit dessert, it looks wonderful. And lucky you, to have someone to make it for you! I’m glad you liked it! Your galette is beautiful! dude you and me we’re right here *points to eyes with index and middle finger then points to the confectiona*. i loath fruity desserts, but my take on this was sublime. Glad you liked the fruit dessert. Your galette looks delicious! You are much more brave than I. I couldn’t do the fruit!! Your galette is very pretty!! So cool that Son gets involved – and you tasted it and enjoyed it! Yay for you!! What better way to eat fruit then encased in wonderful pastry? Yours look beautiful! Yum! We liked it as well. But we are glad next week is some thing not fruit! #1 son sounds like a most excellent baker to me. I’m glad he and Dorie have you expanding your dessert horizons a bit. Great job! Great that your son bakes! Glad you had a taste of this one — the pie crust is so great!